All speeding on so pensively. “’Tis he”, I thought, “That merry glance! “Yet that,” I ponder’d,” can’t be true. “The land has lovers still a few. To her whom next they view’d. The scented zephyr whispers down the hill. The trees droop low to catch his message sweet. It tells me, murmuring softly and discreet. And add more radiant perfume to the air. Enchanted, Nature’s beauties brighter glow. She dons a magic loveliness more rare. Ethereal shines that perfect wistful face. In passion’s colours, scarlet, purple, mauve. And line with light the earth on ev’ry hand. On earth is peace, and in my soul, for Love is nigh. The little rivers murmur quietly. And all the night seems full of mystery. And lull my spirit to an ecstacy. Sentient of Love, lies like a garment on Earth’s breast. Shining in splendour paled Apollo’s light. And terrible my helmet’s nodding height. Entranc’d , in still more perfect beauty glow’d. Of War’s long stress and Music’s pulsing stream. Than all the magic strains of Faëry. Ah! loved one, grant it may no more be dream to me. To charm, where care was, and make glad. Its choicest wares make strong the sad. To give respite where sorrow rode. And lulls that torment’s sway. Or pearls from the Cathay. To wake my slumb’ring lyre. With verse he will inspire. He hides his face and all goes wrong. I’m stranded, so’s my lovely song. Love smiles and I retire. Has one verse pleas’d you, made you smile? 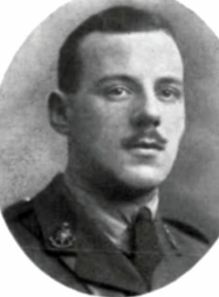 [Second Lieutenant Bertram J.W. Andrews, Royal Sussex Regiment, 13th Battalion (the South Downs), is buried in Dozinghem Military Cemetery, in Belgium]. 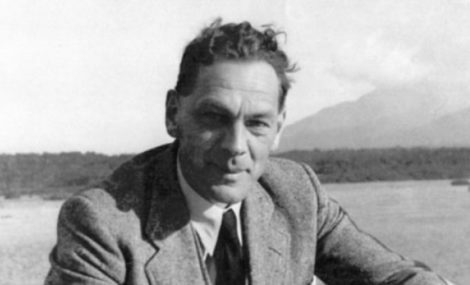 These poems are provided through the courtesy of Discover War Poets. 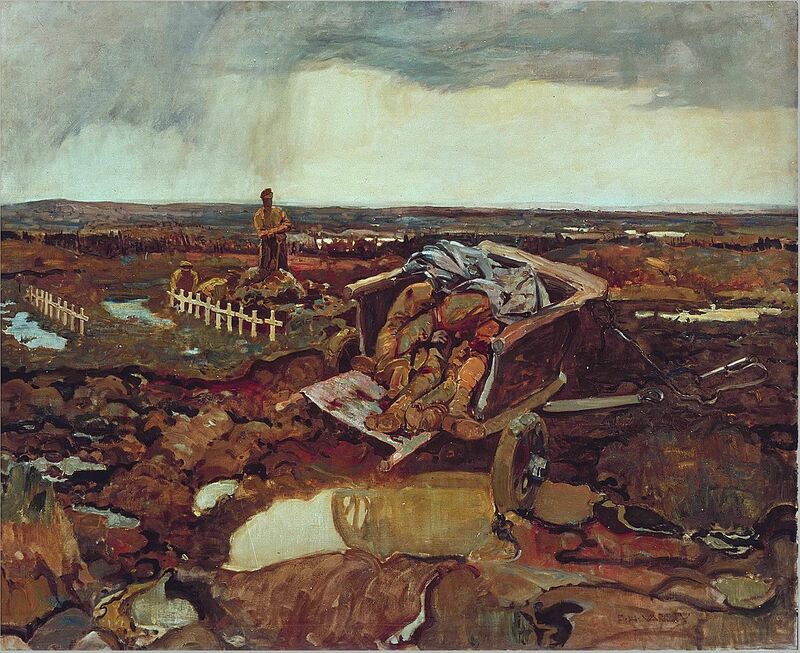 The photo shows, “Mud Road to Passchendaele,” by Douglas W. Culham, painted in 1917. “They were afraid of dying, but they were even more afraid to show it.” This sentence encapsulates the contradictory posture that war imposes on human beings, and this contradiction leads to the recognition that war itself is an absurd act, bereft of any meaning, and existing solely for its own sake. 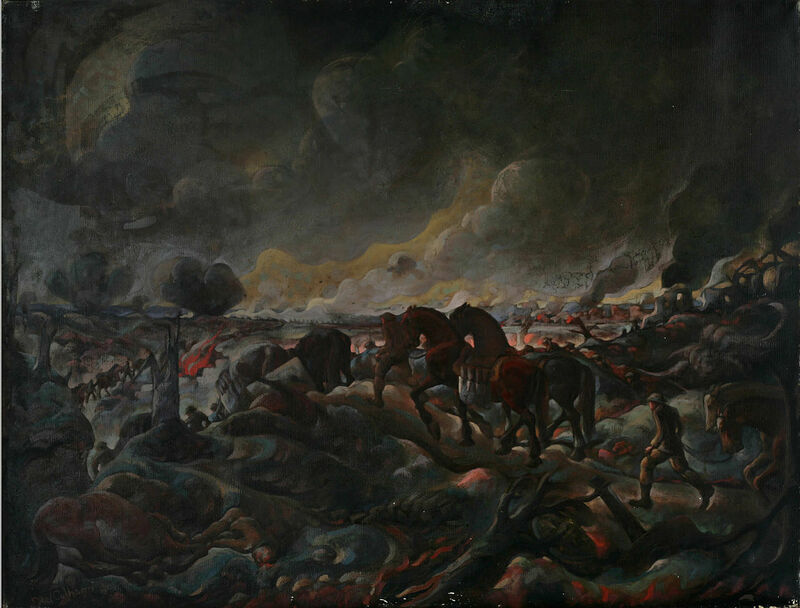 Thus, war can only invoke and provoke a bleak vision, and an absurdist response, which forms the basis of both Fernando Arrabal’s “Picnic on the Battlefield,” and Tim O’Brien’s “The Things They Carried.” In fact, both these works explore the theme of war as an absurd act, in which meaning of any sort cannot possibly exist. Arrabal’s Picnic on the Battlefield explores this absurdity to the fullest by working on a premise that is both laughable and grotesque. First, there is the improbable appearance of Zapo’s parents on the battlefield, who have come out to have a picnic with their son. Suddenly, through the shared suffering (the bomb attack), there is some sort of realization that Zepo is a mirror image of his own son Zapo; there is no difference between them. This remark reinforces the absurdist view that there cannot be such realizations in war – there is only the enemy which one must try to kill. In war, there is only kill-or-be-killed. This is why Madame Tépan’s remark is so efficient at cutting away any meaning that one may seek to give to war – for war is entirely a meaningless act. Thus, the absurdity is heightened by the fact that the play ends with the death of the four characters who have suddenly hit upon the idea of ending the war by refusing to fight. Instead they dance (a life-affirming act); and it is exactly at this point – a point in which they have achieved a semblance of meaning and harmony that war intervenes and they killed. War can only be an absurd nightmare, from which few escape. Cross and his men live in a landscape of nothingness, and when they die, it is an even greater, vaster nothingness. All the soldiers are entirely cut off from all meaning – their sole purpose is to survive. It is a realization that Cross comes to at the end of the end of the story. War is no place for idealism. Martha is not a virgin, nor does she love him; she just offers him a semblance of an imagined world outside Vietnam. But like everything else around Cross, she is nothing more than a daydream – perhaps she is part of the nightmare. The photo shows, “Gassed,” by John Singer Sargent, painted in 1919. “They were afraid of dying, but they were even more afraid to show it.” This sentence, frokm Tim O’Brien’s novel, The Things They Carried, encapsulates the contradictory posture that war imposes on human beings, and this contradiction leads to the recognition that war itself is an absurd act, bereft of any meaning, and existing solely for its own sake. Thus, war can only invoke and provoke a bleak vision, and an absurdist response, which forms the basis of both Fernando Arrabal’s Picnic on the Battlefield, and Tim O’Brien’s The Things They Carried. In fact, both these works explore the theme of war as an absurd act, in which meaning of any sort cannot possibly exist. Arrabal explores this absurdity to the fullest by working on a premise that is both laughable and grotesque. First, there is the improbable appearance of Zapo’s parents on the battlefield, who have come out to have a picnic with their son. War for them is nothing more than some field outing that their son is on, and they have decided to join him. Thus, the absurdity is heightened by the fact that the play ends with the death of the four characters who have suddenly hit upon the idea of ending the war by refusing to fight. War is no place for idealism. Martha is not a virgin, nor does she love him; she just offers him a semblance of an imagined world outside Vietnam. But like everything else around Cross, she is nothing more than a daydream – perhaps she is part of the nightmare. Cross comes to this realization, but he is not moved by it. Thus, both Fernando Arrabal and Tim O’Brien present war as an absurd act. For Arrabal war is grotesque and meaningless and exists only to perpetuate destruction and annihilation. The photo shows, “For What?” by Frederick Varley, painted ca. 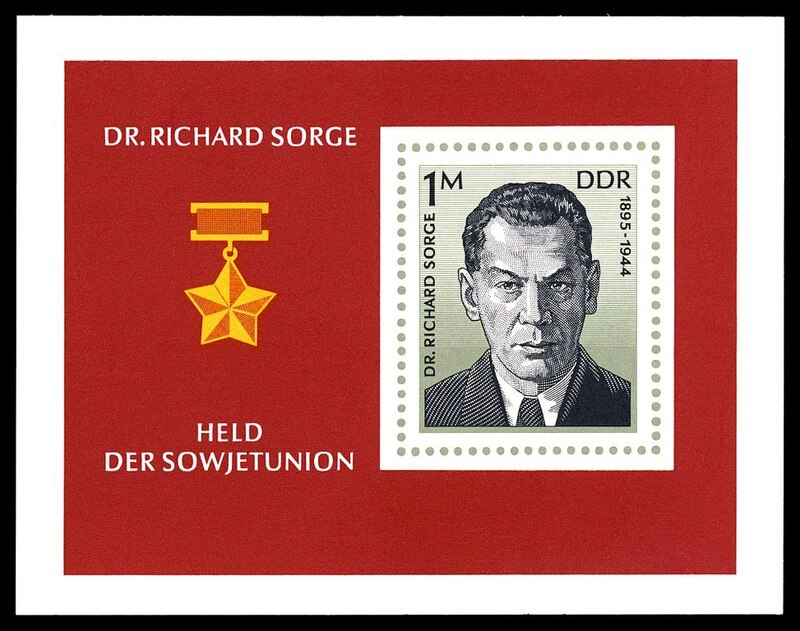 1917-1919.